A few weeks ago I posted about a possible plan to make print versions of my localization comparison projects. The response was far better than I imagined, so I’m pretty confident I’m gonna give a stab at it in the near future. Basically, which of these would you most like to see a comparison of? Keep in mind that there’ll also be a free online version too, so even if you’re not interested in an actual book you’ll get to see the end result. The books will just have added content to them + possible extra goodies. Anyway, vote in the poll below (or here) so I can figure out what I should start looking into! Edit: If you’re not sure what I’m talking about, I’ve compared the Japanese and English versions of a few games, including Super Mario Bros. 1, Legend of Zelda, and most recently Final Fantasy II/IV. See here! It’s not in the poll, but I might want to see a Pokemon comparison. Yeah, I’m really considering that for sometime, I just don’t think I’d want it to be my first outing. A Link to the Past! I hadn’t even considered that as something worth looking into, but I think that could be an amazing comparison! It would be really neat to look into how the game that redefined the Zelda formula (and influenced Ocarina of Time so heavily) was originally localized! This is a really great idea, Mato — I look forward to reading your future localizations no matter what you end up doing. This is pretty exciting! Hopefully everything goes through. You’ll be able to gather a wider audience with other big name titles like Zelda , Final Fantasy, and Megaman, but you will probably have more litigation troubles if you go outside of Nintendo properties. Dragon Quest!!! Dragon Quest!!! Do Dragon Quest!!! You could probably write a whole book on the process of localizing MOTHER 3, the events leading up to it, and what happened after. 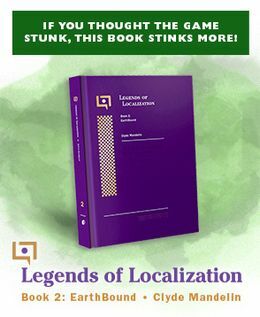 As cool as the MOTHER 3 translation is, I’m not sure it fits in with the other games in the Legends of Localization project because it’s something you worked on directly, rather than someone else’s work that you’re looking at through an outside perspective. I vote for Link to the Past, and of course Mystical Ninja Starring Goemon. It kills me not to vote for DuckTales – just because I love both the game and the cartoon – but I realized there’s not much dialogue in that one anyway (and I’m not sure what other differences there’d be between the North American and Japanese versions). So I’m going to have to say MOTHER 1/EB Zero (gosh, did anyone see that coming? ), your MOTHER 3 translation notes, and Zelda II (as I just played through that one again, and found it wasn’t nearly as bad as I remembered… though still pretty nasty). Totally rooting for you on this, it’s such a fabulous idea that fans would eat up like crazy people who don’t realize you’re not supposed to just eat crack. kenisu: I was thinking the same thing when I did my Super Mario Bros. 1 comparison but it turned out to be far more material-rich than I expected. KingDarian: Actually, part of the neat thing about this series is that some games I’ll take an outside perspective on things and some things I’ll be able to provide different inside perspectives on. I’ve actually been thinking of doing some of these comparisons for my really early fan translations to show what went wrong, why, how to spot it in professional stuff, and pitfalls that amateur/fan translations often have. I voted for EarthBound and Mother 3 because I always love reading about those, but the third I voted for was Zelda II. I think there could be some really interesting things to learn about it! I also want to know if my hunch is right about that “Error” thing– I got the idea that his name may have been intended as “Errol” since that’s an actual name. Given the strange names in Zelda, maybe not, but it’s interesting regardless. Things like that I think are always fun with old games. I voted for Mother, Mother 2/Earthbound, and Dragon warrior/Quest because they probably have the most differences, due to their massive text. Punky: http://matotree.com/localization – scroll down for Super Mario Bros.
kenisu: Yeah, I’m pretty sure that’s exactly the case. That’s one of those things I’m really looking forward to digging into someday. So many memories and awesome stuff I never knew! I’ve seen enough about Mother 2 over the years. I am really, really curious about Mother 3, though, it being my favorite game and all. I definitely second the Pokemon one. Voted for MOTHER 1 and 3 and Final Fantasy 1. Oops! I voted for Link to the Past on accident, instead of Zelda II. I did correctly vote for EB0 and Mother 3 though. I would LOVE to see translation notes for Zelda II and Zelda LTTP. It’s my favorite series of all time, so things like that really interest me. I had to go with Mother 3 and Final Fantasy. I recently watched a playthrough of that one (Well, it was an all-white mage challenge TAS), and I took note of the sheer number of things that had to be truncated into tiny four-letter spaces and such. A lot like things we’ve seen in FFIV, only on a much more NES level, so to speak. I know it’s a giant request. But I would love and would gladly purchase a book that covered all the localization differences between Mother 1-3. Even individual ones I’d get. How about a Doki Doki Panic and SMB2 comparison? Yeah, I hope to do that someday but just not as the very first one I do. Ducktales has me curious. If it doesn’t take too long then that would make for a sweet bonus. Guess I’m a little late to the comment party here, but I would really love to see your current, professional type self, give an in depth analysis of your old work on Bahamut Lagoon. Yeah, I really want to do that someday. It’s interesting seeing my style and approaches change over the years but I don’t think most people would notice unless I point out things like that. Sort of like how artists improve and/or change over years, except without actual art to look at. I would love to see Final Fantasy I. If you like, I could probably offer some assisstance regarding FFI, since it’s one of my alltime favorite games. I’m not fluent in Japanese like you (and nowhere near the experience you have), but I’m decent at it and have quite a bit of knowledge about FFI, especially its NES/FC and PS1 versions.